A unique design crochet cream gilet, with green pompom tie fastening. Made from Organic cotton. 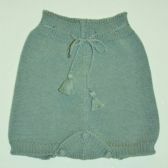 Perfect when combined with the matching knitted culottes, shirt and boots, for the little gentleman in your life.